A number of people have argued that the move by the PAC is unconstitutional. THE OIREACHTAS PUBLIC Accounts Committee (PAC) is set to discuss the costs of the Office of the President at a meeting this morning. There has been much debate about the move in recent days – with Taoiseach Leo Varadkar and Fianna Fáil leader Micheál Martin among those labelling it unconstitutional. Many people have also questioned the timing of the decision, one month out from the presidential election on 26 October. At a meeting last Thursday, the PAC discussed its plan to scrutinise how the annual budget of the president’s office is spent. The overall amount spent by the office is known (direct expenditure was €3.6 million in 2016), but a breakdown of where the money goes is not publicly available. The Office of the President is exempt from Freedom of Information legislation, an issue raised by some journalists who have sought information about expenses. The Fianna Fail TD said he “would not be comfortable having a meeting on the issue after the close of nominations” tomorrow, so here we are. Fleming said he will not allow members at today’s meeting to ask any questions about the president, just expenditure. The President is not answerable to the House, which is a long-standing principle that we will honour entirely. If anyone asks a question about what the President did or did not do, I will rule it out of order. Martin Fraser, Secretary General of the Department of An Taoiseach and the Accounting Officer to the Office of the President, has said the decision is unconstitutional. 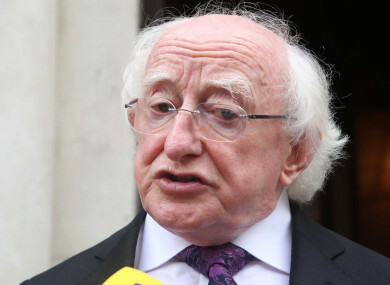 In a letter sent to the PAC on 17 September, Fraser stated: “The Office of the President is separate and distinct from other organs of State, such as the Executive (including Government Departments), the Oireachtas and the Judiciary. Fraser said he was surprised that the PAC had not sought legal advice on pursuing the issue. Speaking at the meeting last week, Fleming said legal advice had not been sought “because I understand that we will not direct any questions to [Fraser] in respect of the President and will question him only in relation to the financial matters for which he is Accounting Officer”. In his letter, Fraser also raised concerns about the “political impartiality of the Civil Service” as well as timing issues. “It is an inviolable principle that civil servants should not become involved in election campaigns. The fact that the current campaign is unusual, in that a sitting president is seeking re-election does not affect the principle involved. “I cannot accept your suggestion that the campaigning period has not yet started. It is absolutely clear that a campaign for the office of the presidency is fully underway,” Fraser wrote. Labour TD Alan Kelly questioned why the committee had not sought legal advice about the matter. He suggested that proceeding with the examination “will be damaging to this committee and will have an impact on the presidential election”. “The fact is that this is an ongoing campaign. If we are going to jump into this now, it will really say an awful lot about this committee,” he said. Sinn Féin TD David Cullinane said he has “no difficulty” with the committee discussing the expenses but does not “want us to waste our time if Mr Fraser is going to come in and say he cannot answer any of the questions we ask”. A number of the PAC members criticised Fraser’s letter, with Fianna Fáil TD Marc MacSharry saying the “tone of the letter did bother me”. We should do it. We should keep the questioning very much to the question of where the money goes and what happens to it. Independent TD Catherine Connolly said the level of argument against inquiring into the spending worried her, stating that she was fed up of “patriarchal” arguments from people who think “we know best; do it later; now is not the time”. “There is nothing wrong with information, dealt with properly by ourselves in an open and accountable manner,” she said. How much we learn about the expenses will become clear later this morning. The meeting is due to commence at 10am in Committee Room 3. You can watch proceedings here. Email “Explainer: Why examining presidential expenses could be a problem ”. Feedback on “Explainer: Why examining presidential expenses could be a problem ”.